Stephen Palmer of the National Gelechiid Recording Scheme,has confirmed that the following species we have taken over the past few years, are all new to Nottinghamshire. Monochroa lucidella and Monochroa palustrella, singles at MV light, Eakring Flash 26/07/08; Exoteleia dodecella, adult at MV light, Lound Wood, Eakring 31/07/10; Syncopacma taeniolella adult, Warsop Main Pit Top 14/06/11; Psoricoptera gibbosella adult at MV light, Sherwood Forest CP 07/08/10 and Apodia bifractella, two on Fleabane flowers, Warsop Main Pit Top 12/08/12. We have recently recieved information regarding the current UK status of Cryptocephalus coryli, which has been believed to only occur in the UK at Sherwood Forest CP. Since 1970 it had been found at only three single sites - in Berkshire, Lincolnshire and Surrey (Ref: Natural England) and was believed extinct from all other known sites, after no recent records were forthcoming following enquiries by several authors of recent reports on the beetle. However, a recent email (Sep 2012) has implied that C. coryli is still being recorded from the North Downs in Surrey, Woolmer Forest in Hampshire and at one Lincolnshire site. 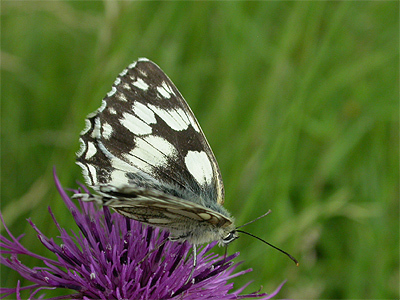 A visit to the Hills and Holes SSSI at Market Warsop on July 18th, provided a pleasant surprise when over a dozen Marbled Whites were discovered in an un-grazed section of the site. Further visits estimate that the population, which seems to have been spreading away from the know site at Portland Park, Kirkby-in-Ashfield, numbers well over 40 adults. Of course speculation that they have been released from captive bred stock abounded at the news, but we personally feel that this is genuine spread eastwards. Whatever their origin, this butterfly provides a welcome sight within ten minutes walk of our home and several other residents seem very pleased at the sight of this delightful butterfly. A casual hour spent walking around Sherwood Heath SSSI recently, saw us record four adult Forester moths nectaring on Creeping Thistle flowers. The Forester is rare in Nottinghamshire, restricted to a couple of localities in the Sherwood Forest area, including Budby South Forest and Clumber Park and the four on Sherwood Heath represent an important first for the site. Unfortunately, most of the Thistle and Ragwort flowers had been cut down, but the few flowers remaining highlight the importance of leaving 'rank' nectar-bearing plants like Creeping Thistle on SSSI's, as they are vitally important to the fauna they attract. 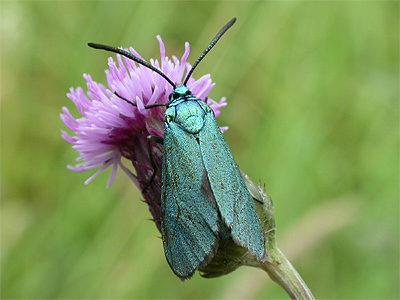 Unfortunately, the habitat conservation bodies believe they devalue a site's SSSI status, but allow these plants a place and you can get species' such as the Forester moth. 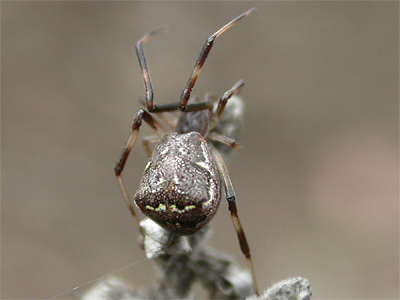 Two recent visits to the Gleadthorpe Open area of the Sherwood Forest CP to search for the RDB2 spider Zora silvestris, have both produced two new invertebrates not recorded from Sherwood Forest before. In fact one of these, an Assassin Bug nymph (possibly Coranus subapterous) that was found by Gary Joynt and ourselves seems new to Nottinghamshire. The other new species is a heathland spider Episinus angulatus, which was found by Carl Cornish of the RSPB, whilst we were looking at Zora silvestris, which had been our target species of the morning on a visit with Nick Crouch of Nottinghamshire County Council. May 2012 has seen a significant increase in sightings of the 2-spot Ladybird Adalia bipunctata which is now turning up in small numbers at most sites we visit. Four in our own garden recently, was the highest count we have had here in many years. Although numbers are currently only small, they do represent the most significant counts locally since 2007. May 29th was yet another blank night for Glow Worms at Clipstone Old Quarter, but the sighting of another invertebrate known to produce a glow, has now become the number one target species to capture an image of. On the top path of our survey route, which is the darkest section on site, I spotted a bright glow and immediately thought the first Glow Worm had appeared and that it had somehow been missed on the first walk a few minutes previous. Then I thought it must be a glowing larva located under a few leaves on the edge of the path. I was stunned when after kneeling down for an investigative look, suddenly saw a Geophilid Centipede glowing totally from end to end as it moved about on the path surface. Even more interesting was the strong trail of glowing droplets of liquid left in its path. Quite frankly, this was one of the most stunning sights I have personally ever seen and had read about their glowing ability a few months ago, but little could be found out about how bright a Geophilid glow was, how long it lasted or anything else. There were very few useful reports on the internet, but there was one on the UK Glow Worm Survey website. But it seems that the few reports there are, all came from members of the public, who's reported sightings often tend to be extremely vague and usually of little accuracy. The Centipede glowed for at least 15 seconds and it may have only stopped glowing on an unsuccessful attempt to pot it, but the droplets forming the trail continued to glow for slightly longer. On 20/05/12, Gary Joynt found a female at the base of a Birch trunk, which has effectively changed our knowledge of Cryptocephalus coryli at Sherwood. The importance of the find, is that this beetle was discovered for the first time within closed canopy woodland, around 50-60 metres away from the woodland edge where the beetle regularly occurs. It means that coryli must also be found on Birches situated quite deep within areas of woodland and that they are not completely confined to warm south-facing trees or woodland edges. The first adult (female) Cryptocephalus coryli, known commonly as the Hazel Pot Beetle, was found recently emerged on grass at Sherwood Forest CP on May 17th. A Lily Beetle found in the visitor centre compound by ranger Gary Joynt in early May 2012, is the first ever NNR record. This common garden beetle, seems to be spreading away from its favoured urban garden habitat, as we also recorded an adult from woodland (on Garlic Mustard) near Market Warsop on May 12th. Although Spring was extremely early last year, normally by this time many beetle species are active and already being found in good numbers. But at the moment it looks and feels more like mid-April, rather than mid-May. We only conducted our first search for Cryptocephalus coryli on May 14th, but despite being sunny for long periods, a chilly breeze ensured little was found and there is no sign of any adult C.coryli yet. A large spider found under a piece of fallen bark in a section of the Birklands West and OIlerton Corner SSSI, turned out to be a female Coelotes atropos and the first Sherwood Forest record since the BAS survey of 1978. 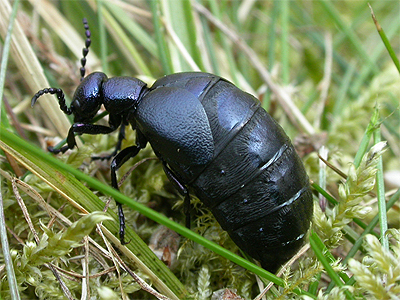 We decided to check for any Oil Beetles early this year (March 23rd) as the weather had been fine, dry and very warm for March. Hoping that there would be at least one early adult, we were amazed to find 61 (35f and 26m) during a quick search of the same area as last year. Such a total would probably represent a good colony by any standards nationally, and beats the highest count in 2011 of 37 adults, by some considerable margin. Once again, females out-numbered males. 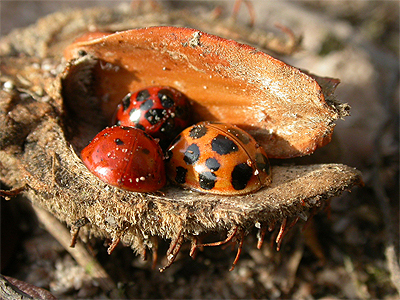 The beetles were found grazing in typical fashion, at various stages of burrow construction (including one egg laying) and several mating pairs. A further count of 47 adults (28f and 19m) came on April 5th. A late start to the butterfly year on March 22nd, with two Small Tortoiseshell at Eakring Flash and a male Brimstone noted at Kersall. A mild late February saw us making our first casual survey of Clipstone Old Quarter in the hope there was a chance of an early Glow Worm larva. 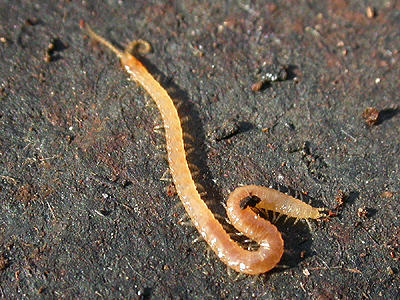 The venture proved successful with two larvae found on February 28th, along the usual survey path. More large numbers of 7-spot Ladybirds found on the growth tips of small Pines at Warsop Main Pit Top (27/01/12) with approximately 2 088 adult 7-spot Ladybirds counted, along with 15 Adonis and singles of Harlequin, 2-spot, 10-spot, Pine and Kidney-spot Ladybird. A walk along the southern and eastern edges of Hare Hill Wood near Kersall on January 17th, led to a minimum count of 1 278 adult 7-spots and a single Harlequin Ladybird. Some brief searching under Elm bark also produced single records of the Carabid Dromius quadrimaculatus and Hawthorn Shieldbug. A walk around Cuckney Hay Wood on January 13th, to monitor the numbers of two large groups of over-wintering Harlequin Ladybirds found back in early November 2011, revealed that (since last being checked) counts had risen by over 80, to a present total of 348. The full count of Harlequins found was 475. Over 300 7-spot Ladybirds and four Adonis Ladybirds were also counted during the walk. 7-spot Ladybirds have often been active over the Winter period so far and small groups can still be found tucked into Thistle heads and other dead vegetation. Our first walks around Sherwood Forest recorded a few Nalassus laevioctostriatus and the active workings of the impressive Minotaur Beetle commonly at Clipstone Old Quarter, whilst a single Tetratoma fungorum was disturbed from a Birch Polypore at Sherwood Forest CP. With the incredibly mild Winter so far (still just three nights of frost at Market Warsop by January 11th) finding invertebrates has been relatively easy. Around in good numbers are the spiders Zygiella x-notata and Nuctenea umbratica both common pretty much anywhere, whilst several female Metellina segmentata were recorded during late December 2011 and into the first week of January 2012, at Market Warsop and Sherwood Forest CP. These would normally have been killed off by the first Winter frosts. 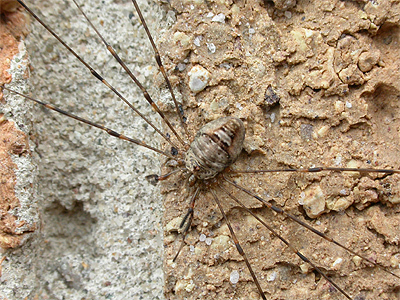 Two Harvestmen still around till Christmas were small numbers of Dicranopalpus ramosus and Paraligolophus agrestis on fences and walls of the visitor centre at Sherwood Forest CP.